A strange fact about the potential life span of a modern building is that after 40-50 years those who have a say in its destiny are prepared to jettison it and rebuild. However, should the building escape demolition and survive another 30 years it is likely to be recognised as architecturally valuable, and considered worth preserving. Unfortunately, much of the most valued modern heritage can only be assessed through the photographic images that survive them after their precipitate destruction. In the light of this observable time gap between the life of the building and assessment of its architectural worth, it would be wise for the new Minister for Social Housing, NSW, Pru Goward, to reconsider the demolition of Matavai and Turanga. If, as it seems, the government is determined on the destruction of the towers then the future may label her as an architectural vandal, laying waste an important example of Sydney Brutalism. Their preservation would bear testimony to the insightfulness of a Minister who could recognise and protect a unique style of public building and a significant cultural legacy. The twin 29-floor towers with gardens and a shared common grassed area were designed to house vulnerable elderly residents by the then government architects, Stafford, Moor and Farrington. Built in 1976, Matavai and Turanga, named for Captain Cook’s Pacific voyages, were well established initially as a socially important build. Queen Elizabeth II and Prince Philip opened the complex in 1977, Queen Halaevalu Mata’ho of Tonga visited the towers in 1979, and Canada, New Zealand and New Guinea contributed to the towers’ decor. Furthermore, a fashion show was held in the complex and attended by Laurie Brereton, the then Minster for Housing and Public Works, evidence that a complex housing the disadvantaged elderly was worthy to host high-end events. In late 2017 the towers, although their infrastructure is sound and architects of repute, for instance, Glen Harper, rate them as important examples of brutalism, are slated for demolition. While brutalism is not to everybody’s liking it is well recognised that beauty is a matter of taste and heritage is not a matter merely of the picturesque. While heritage does mean something that is handed down from the past and belonging to the collective cultural, the past is not confined to the 19th century, but generally indicates a practice that has changed so substantially it no longer has an active application in the present. Brutalism, coined by Reyner Branham from béton brut (raw or roughly finished concrete) is a practice that can never be repeated. As such builds are no longer affordable and the requisite skill sets no longer available, Sydney Brutalism is very much “ago” but acknowledgement of it, and pride in its achievement, is a legacy that should not be lost to the future. The towers are structures of an uncompromised integrity. Basically, they are composed of small units located around two lift wells and accessed via a common passageway leading from and returning to a common area opening out from the lift doors. At ground level the residents exit the lift into a main foyer with the letterbox area to the left, socially the most significant area, and ahead glass doors which lead into a well-patronised garden. An underused community room and amenities area lie to the right of the lifts and to the centre another set of glass doors leads into a transitional space with a concierge enclosure, another significant area of interaction, and glass doors leading to an unpretentious but sheltering portico. The horseshoe driveway connecting the towers with each other and Phillip Street is in form and function more like a road. From the exterior, the design is strong and simple, a massive unadorned concrete rectangle with small and large windows, their alignment indicating each floor. As is often the case with brutalism, details of the design, such as the horizontal metal bars at balcony height across the large windows, simply and effectively offset the rectangularity, while the curved concrete corners of the large window surrounds soften but don’t counteract the filmstrip effect. In the dawn, at sunset and at midday the play of light and shadow across the table rasa of the towers’ surfaces provide exciting visual drama. At night there can be no more impressive sight than the dark shape of the towers against the city-lit sky, the windows gleaming and winking, signaling the many, many little worlds secured by these concrete giants. In the stakes for memorability as image the towers are unsurpassed. Their familiar shape, rather like a super-size rectangular battery, the huge shaft crowned by a mega water tank, is readily recognisable and beloved of photographers. As a robust visual statement of socio-political commitment to housing the vulnerable, the towers represent an honest, egalitarian vision. In choice of material and in choice of structure they are what they are: and for what they are, if we want the future to think well of us, we will fight for their right to stand where they do. If you think this is brutalism perhaps you should get yourself a picture book to see what brutalism really is, or you could look up the Smithsons, or the London Festival Hall. 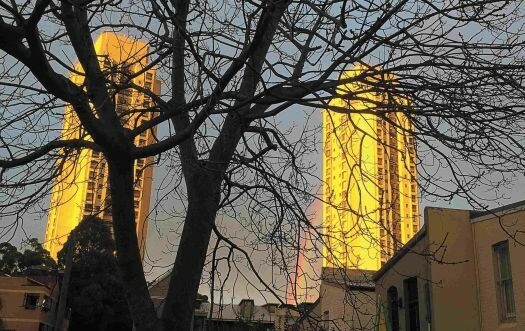 A rainbow behind the buildings creates beautiful lighting and dramatically changes the perception of bare grey concrete constructions. Bang on !! I’ve been looking at these buildings recently and believe they absolutely should be preserved. Would be a master stroke for Sydney. Wake up Elizabeth F!